K.A. 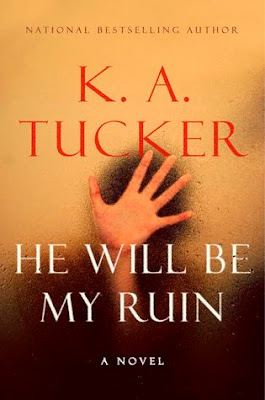 Tucker continues to impress me, and I absolutely devoured He Will Be My Ruin. This book was somewhat of a departure from her Ten Tiny Breaths and Burying Water series, both of which I adore. This new novel is a superb mystery thriller which I could not help but read in one sitting. Devoted friend Maggie Sparkes is a likeable and tenacious main character who, along with a remarkable assembly of characters, begins to unravel the secrets surrounding best friend Celine Gonzalez’s suicide. The story and characters drew me in and kept me utterly absorbed. This book was made for me with Celine’s antiques, appraisals, and extraordinary finds, which are somewhat of a passion of mine as well. I loved the maturity of the characters, the intricate plot, and the perfect pacing, all of which flow brilliantly from this amazing storyteller. Spellbinding from prologue to epilogue, this is a must for mystery lovers and fans of K.A. Tucker. I have read nothing but good reviews for this one, so I snagged a copy last week. I have been in the mood for suspense and thrillers lately. I think you'll enjoy this, Heidi! I've heard so many good things about this one! I'll be getting it soon. I am so glad you enjoyed this as well. We are review twins today. I was happy to see a post from you in my inbox! Review Twins! I'm so happy you loved this one, too. So great hearing from you, too, my friend! Sounds like this one was just an amazing read and I have to pick it up! The plot really draws my interest as do the characters. I'm not much of a mystery thriller girl, but I adore Tucker and she just has a way of always pulling me into her stories! I know I have to read this one! I was really happy with how this was a bit of a departure from her other books. She has talent, that's for sure. So much talent -- she continues to impress! Tucker is new to me. I'm not much of a suspense/thriller reader so I'm not very sure if I want to read this book. I'm going to add it to my list anyway for those times when I want to branch off from my usual reads. I'll look into Tucker's other books too. The Burying Water series is a phenomenal romantic suspense series -- I highly recommend it :) For more contemporary romance you could try the Ten Tiny Breaths series. Thanks for stopping by!